The Santa Maria Formation is a sedimentary rock formation found in Rio Grande do Sul, Brazil. 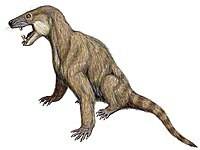 It has a Late Anisian to Early Norian age (Early to Late Triassic), and is notable for its fossils of early dinosaurs, including the herrerasaur Staurikosaurus, the basal saurischian Teyuwasu, and the basal sauropodomorph Saturnalia. It received this name because it was discovered first in the city of Santa María. The distinguished English paleontologist Arthur Smith Woodward determined the age of Santa María Formation dated Mesozoic Era, Upper Triassic period (about 220 million years). A U-Pb (Uranium decay) dating of the Alemoa Member found that the Santa Maria Formation dated around 233.23±0.73 million years ago, putting that locality 1.5 million years older than the Ischigualasto Formation, and making the two formations approximately equal as the earliest dinosaur localities. The Santa Maria Formation is in the geopark of Paleorrota. A partial mandible having some complete teeth. Several Skulls A chiniquodontid cynodont. Disarticulated cranial and postcranial elements. Nhandumirim N. waldsangae A possible Theropod dinosaur. "ULBRA-PVT016, disarticulated partial skeleton... including most skull bones"
"[Three] partial skeletons, dentary, adult." "Partial postcranial skeleton with mandible." Unnamed lagerpetid Unnamed Rio Grande do Sul Candelária Sequence Specimen UFSM 11611 (partial left femur) Taxon distinct from Ixalerpeton polesinensis. ^ a b c d e f g h i j k l m n o Weishampel, David B; et al (2004). "Dinosaur distribution (Late Triassic, South America)." In: Weishampel, David B.; Dodson, Peter; and Osmólska, Halszka (eds. ): The Dinosauria, 2nd, Berkeley: University of California Press. Pp. 527–528. ISBN 0-520-24209-2. ^ Langer, M.C. ; Ramezani, J.; Da Rosa, Á.A.S. (2018). "U-Pb age constraints on dinosaur rise from south Brazil". Gondwana Research. X (18). Bibcode:2018GondR..57..133L. doi:10.1016/j.gr.2018.01.005. ^ a b c d e F. Abdala & A. M. Ribeiro (2003). "A new traversodontid cynodont from the Santa Maria Formation (Ladinian-Carnian) of southern Brazil, with a phylogenetic analysis of Gondwanan traversodontids". Zoological Journal of the Linnean Society. 139 (4): 529–545. doi:10.1111/j.1096-3642.2003.00096.x. ^ Oliveira, T.V. ; Soares, M.B. ; Schultz, C.L. (2010). "Trucidocynodon riograndensis gen. nov. et sp. nov. (Eucynodontia), a new cynodont from the Brazilian Upper Triassic (Santa Maria Formation)". Zootaxa. 2382: 1–71. ^ Flávio A. Pretto; Max C. Langer; Cesar L. Schultz (2018). "A new dinosaur (Saurischia: Sauropodomorpha) from the Late Triassic of Brazil provides insights on the evolution of sauropodomorph body plan". Zoological Journal of the Linnean Society. in press. doi:10.1093/zoolinnean/zly028. ^ Marco Aurélio G. França; Jorge Ferigolo; Max C. Langer (2011). "Associated skeletons of a new middle Triassic "Rauisuchia" from Brazil". Naturwissenschaften. 98 (5): 389–395. Bibcode:2011NW.....98..389F. doi:10.1007/s00114-011-0782-3. PMID 21445632. ^ Marsola, Júlio C. A.; Bittencourt, Jonathas S.; J. Butler, Richard; Da Rosa, Átila A. S.; Sayão, Juliana M.; Langer, Max C. (2019). A new dinosaur with theropod affinities from the Late Triassic Santa Maria Formation, South Brazil. Journal of Vertebrate Paleontology doi:10.1080/02724634.2018.1531878. ^ a b c d e Cabreira, Sergio F.; Cesar L. Schultz; Jonathas S. Bittencourt; Marina B. Soares; Daniel C. Fortier; Lúcio R. Silva; Max C. Langer (2011). "New stem-sauropodomorph (Dinosauria, Saurischia) from the Triassic of Brazil". Naturwissenschaften. 98 (12): 1035–1040. Bibcode:2011NW.....98.1035C. doi:10.1007/s00114-011-0858-0. PMID 22083251. ^ Langer, M.C., Abdala, F., Richter, M., and Benton, M. (1999). "A sauropodomorph dinosaur from the Upper Triassic (Carnian) of southern Brazil." Comptes Rendus de l'Académie des Sciences, 329: 511-;517. ^ a b c d e f "Table 2.1," in Weishampel, et al. (2004). Page 26. ^ "Table 12.1," in Weishampel, et al. (2004). Page 235. ^ Maurício S. Garcia; Rodrigo T. Müller; Átila A.S. Da-Rosa; Sérgio Dias-da-Silva (2019). "The oldest known co-occurrence of dinosaurs and their closest relatives: A new lagerpetid from a Carnian (Upper Triassic) bed of Brazil with implications for dinosauromorph biostratigraphy, early diversification and biogeography". Journal of South American Earth Sciences. 91: 302–319. doi:10.1016/j.jsames.2019.02.005. Weishampel, David B.; Dodson, Peter; and Osmólska, Halszka (eds. ): The Dinosauria, 2nd, Berkeley: University of California Press. 861 pp. ISBN 0-520-24209-2. This page was last edited on 20 March 2019, at 16:47 (UTC).